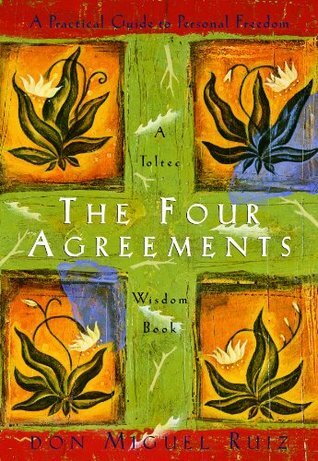 I first read the book, “The Four Agreements” well over 10 years ago. Even at that time, I was struck by how such a small book could pack such a big punch and it had a strong impact on me. I was a few years into my own healing and self discovery journey and this realization that there was this collective dream in which we were living was a fairly new one for me and one that I was having a hard time wrapping my head around in any real way. It is, after all, a pretty deep concept – this one of “real”. I tried to implement each of the four agreements with varying success. It was difficult to overlay these new agreements on top of my old ones and I ultimately forgot about them. Many years later, I returned to “The Four Agreements”. Because my yoga practice had deepened significantly, I read the book with new eyes and therefore was able to understand so much more about it. My yoga practice taught me that I had to release what no longer served me so that I would have room for new things. That definitely applied to my experience with “The Four Agreements”. I better understood that the reason it didn’t fully stick the first time around was that I was trying to overlay these new agreements on top of my old ones and that wasn’t going to work. There was no space available so even though I tried, I wasn’t able to be truly successful. Once I was able to let go of some of my old agreements and do the work necessary to allow that letting go to happen fully, then I had the space to make some new agreements. Not only that, but I found that in closely examining my old agreements, I was able to see where they were in direct conflict with “The Four Agreements” and it made even more sense to me why I wasn’t able to successfully integrate them the first time. Once I did the background work, not only was there space in my life for the new agreements, I found that my Being lined up around “The Four Agreements” in a way that it didn’t before. As I have read through “The Four Agreements” and “The Fifth Agreement” most recently, alongside the “The Yoga Sutras of Patanjali” and “The Bhagavad Gita”, I can see how closely related they all are and how the Yoga Sutras and the Gita provide the depth and the framework for awareness, letting go, and creating lasting change that are so necessary if you want to truly integrate “The Four Agreements” and “The Fifth Agreement” into your life. Join me for this 12 week series as we explore the depths of our being, identifying the roots of our old agreements, pinpointing what no longer serves us, and creating an environment and the energy needed to let go of those things so that your are open and free to integrate these new, positive and life-sustaining agreements into your life. Doing this work will make the difference between reading a great book with some good ideas, and taking in these teachings and integrating them into your life creating lasting transformation and change. Join Krista for a COMPLIMENTARY session of this course on Wednesday, September 16 7:30-9pm. Sign up under Drop-In Class Tab. Limited space. Krista took her first yoga class in high school over 20 years ago and, as a dancer, she fell in love with the flow and precision that the postures required. Her practice became more regular after the birth of her first child and became more steady and dedicated from there. After the birth of her twins in 2007, yoga became a refuge for her. She found herself coming to the mat for much more than just a physical practice; she needed the calm that her practice provided in order to cope with the craziness of mothering 4 boys and all of the other stressors and busy-ness of life. She credits her yoga practice with keeping her sane through those long days and nights when sleep was a distant memory and everyone needed her every moment of the day. Krista completed her 230 hour training at the Yoga Center of Minneapolis in 2010 and has also studied with teachers such as Seane Corn, Gary Kraftsow, Rod Stryker, and more. She keeps her own practice a priority which in turn, makes her an inspired and creative teacher. Krista’s focus on adapting postures for different levels make her classes available to a wide range of students. She loves teaching a combination of flow and traditional Hatha styles and weaves a theme into each one of her thoughtfully created classes which also often include pranayama and meditation. Teaching Yoga Nidra is one of her favorite things. She loves the healing and deeply nourishing aspects of Yoga Nidra and teaches it regularly to students of all ages.